LifeCycle have advised us that there a few places left on this course which starts in Bristol on 5 June. 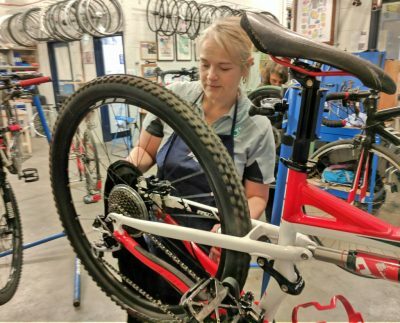 It’s aimed at people who already know some bike mechanics and want to take their skills further: to be able to completely strip down and rebuild a bicycle. LifeCycle supply overalls, gloves, workstands, bikes to work on, comprehensive teaching notes and all tools. All proceeds from the course go back into LifeCycle’s charitable activities – bookings support their work directly. You can find more information on their City & Guilds course page.